What’s With The Outer Banks Wild Horses? When you come to the beach, the desire to see marine wildlife is understandable. From sea turtles, dolphins and sharks to crabs, birds and even the occasional seal, you never know what animal you might encounter while touring these unique barrier islands. One wild animal you might not expect to see however are wild horses. You may have heard about the Outer Banks wild mustangs that roam the beach in realty ads, magazines and even popular films but if you’ve never driven up the winding highway to Corolla, you’ve probably never seen them for yourself and believe me, you’re missing out. If you’ve been wondering "What’s with the Outer Banks wild horses?" ...We’ve got the answers. The wild mustangs of Corolla are not native to the Outer Banks but rather were brought to the “New World” by Spanish explorers. Bringing horses overseas was not uncommon during the time of early explorers as documents show Christopher Columbus brought Spanish horses on his voyages to the West Indies in the 1490s. According to ship logs from the 16th century, among the typical products Spaniards traded (like sugarcane), livestock was a major commodity and this included horses. Specifically, the modern Outer Banks wild horses may have descended from breeds that arrived with the expeditions of Lucas Vasquez de Allyon (who likely landed around modern day Shackleford Banks in 1521) and Richard Greenville (who frequented the Outer Banks coast for trade purposes between 1584 and 1590). Other theories speculate that Spanish ships that were lost in the treacherous Diamond Shoals, or perhaps ships that were forced to make landfall due to bad weather, may have supplied the population as the horses could have reached land themselves or may have been released and left behind. Either way, the herd thrived enough to maintain a sustainable population and documentation in the historical archives show evidence that the herd was present along the Outer Banks and Shackleford Banks coast all throughout the last few centuries earning them the name “Banker” horse. The term “mustang” is a general term used to refer to feral horses in America that are of Spanish descent so the Bankers are often referred to as wild mustangs. Banker horses are believed to have been descendants of the Spanish Barb and Arabian breeds. Arabian horses are known to have one less vertebra than most other horse breeds and Bankers share that same trait. They also feature a mix of the Iberian convex head as well as a concave head shape. Typically, they are smaller in stature and weigh from about 800 to 1,000 pounds at a height rarely exceeding 14 hands. Usually chestnut, bay, or dun in color, the horses tend to be docile in nature and live on Spartina grasses, sea oats, and other native vegetation. Their freshwater sources include rain water and ground water obtained from the digging of small holes. Rescued Bankers that are adopted are known to remain docile with good stamina and are often used for joy riding. Throughout history, Bankers have been used for beach patrols and hauling equipment. In 2010, NC Governor Beverly Perdue designated the Colonial Spanish Mustang as the official North Carolina State Horse. Bankers are found in Corolla and three other coastal locations. 1) The small herd of Bankers (roughly 15) found in Ocracoke are managed by the National Park Service. As of 1959, the “Ocracoke wild ponies” were penned in to protect them from vehicle interaction and avoid overgrazing in a 180-acre pen. 2) Similar to the Corolla herd, the Shackleford Banks herd sits at a population of around 120-130. Managed by the National Park Service and the Foundation for Shackleford Horses, this herd is protected by federal law and roams freely along 3,000 acres of the Cape Lookout National Seashore. 3) Lastly, a small herd of about 30 – 40 horses can be found at the Rachel Carson National Estuarine Research Reserve in Beaufort. Managed by the state of North Carolina, this herd arrived on the reserve in the 1940s and may have come over from the nearby Shackleford herd or left by residents of the island. In addition, there is a small herd of about 50 horses that freely roam on private land on Cedar Island. The herd that exists in Corolla today has over 7,500 acres to roam free although that land is shared with homes, roads and people. In 2007, the Horse of the Americas Registry (HOA) determined the Corolla herd were officially eligible for registration as Colonial Spanish Mustangs. REPORT: If you spot a sick or injured horse, report it to the Corolla Wild Horse Fund or the Currituck County sheriff’s dispatch. Do not try to help the horse as it could injure you or be further injured itself. If you see someone violating an ordinance, report the incident to the Currituck County sheriff immediately. OBSERVE: Never come within 50 feet of a wild horse or herd of wild horses. If you are approached by a group of wild horses on the beach, please respect their space and move away per the ordinance. RESEPCT: Never feed a wild horse. Fruits, vegetables and other snacks can cause extremely dangerous digestive issues that could be fatal. PRESERVE: If you would like to get involved in conservation efforts, please visit the Corolla Wild Horse Fund’s website to learn more about making a donation, becoming a member, sponsoring a horse, or volunteering. Formed in 1989, the Corolla Wild Horse Fund (CWHF) was developed to preserve and protect the Banker Mustangs of North Carolina which are deemed as Critically Endangered by The Livestock Conservancy. It wasn’t until 2006 that the organization even had full-time staff so almost all preservation work over the years has been achieved by passionate volunteers eager to preserve a unique part of our state’s history. To manage the population, a Herd Manager documents each horse in a database by using identifiable markers like color and other markings. Field observation is combined with an aerial helicopter count to determine the current herd population. The target population is between 120 and 130 as it is large enough to sustain the population while still preventing other dangers like overgrazing. A population of less than 110 means the horse could be in danger of becoming extinct. Part of the fund’s goal is to educate visitors about the wild horses. Unlike domestic breeds, Banker horses must maintain a very strict diet and are not equipped to eat fruits and vegetables. When visitors feed a wild horse a snack that a domestic horse might eat, they are putting the horse in very great danger of terrible digestive side effects that could be potentially fatal. When a horse is injured or falls ill, the CWHF will bring in equine vets to treat horses in the field when at all possible. Bankers are not able to be removed from their habitat and kept among domestic horses fore care and then returned to the wild due to the risk of spreading a domestic disease to the wild herd who lack immunity to surive the illness. In addition, horses brought to a care center are also more likely to approach humans due to the human interaction which is very dangerous for the wild herd. If not possible to treat them in field, there are cases when a horse is too ill so CWHF must capture the horse and care for them in a rehabilitation center. Those who make full recovery are available for adoption and are housed at a 21-acre facility in Grandy. If you want to see these beautiful animals galloping along the beach for yourself, a guided Wild Horse Tour is an excellent way to learn more about the Corolla Banker Mustangs and get some great photo opportunities. While you may spot a horse while lounging on the beach yourself, professional tour guides are able to take you across the bumpy beaches and through unique back town roads where the horses often frequent while answering any questions you might have about the herd. Seaside Vacations partners with Corolla Outback Adventures through our Club Seaside Program to give our guests the experience of a lifetime by providing a discount on your horse tour reservation. Click Here to learn more about the promotional offer available for guests of Seaside Vacations. We highly encourage you to try a tour during your next vacation… you won’t be disappointed. 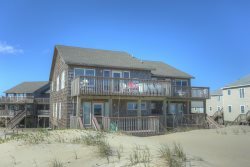 If you're planning a vacation in Corolla, we offer a wide selection of Corolla Vacation Rental Homes to suit any family's needs. April 2019: Another new foal has been spotted. Learn more about new foal, Rosie, and keep up to date on all of the new Corolla wild horse foals of 2019. March 2019: The first foal of the year was born on March 31, 2019! Named "Renzi" after a terminally ill fan of the Corolla wild horses, he can be spotted roaming the beaches of Corolla. February 2019: In early February, the CWHF Herd Manager, Meg Puckett, released a statement showing that while the herd tends to roam along the beaches in the warmer months, they are currently spending this winter in a fresh water marsh only reachable by boat (or in this case, spotted from the air). January 2019: On a bright note, earlier this year, legislation was introduced to the Congress to provide responsible management of the Corolla wild horses through a new management plan created by the Corolla Wild Horse Fund as well as the U.S. Fish and Wildlife Service, the state of North Carolina and the County of Currituck. December 2018: Visitors from all over the world love to stay up to date on the news of these majestic beasts. Unfortunately, the news isn't always positive. In December 2018, one of the more well-known wild horses, Roamer, fell ill with colic and died. Known as "ambassador for the horses," Roamer was part of the “Meet a Mustang” program at the rehabilitation center. As one of the oldest in the Corolla herd, he had a propensity to roam among tourists and was often used in billboard ads. For more news about the Corolla Wild Horses, visit the CWHF news page.